There are many choices today when it comes to getting rid of cable. There are so many services and products which can become quite confusing. Knowing what are the best streaming services, devices and HD antennas can become very overwhelming. We have compiled a list of products and services that we recommend. Amazon Prime Instant Video has a great selection of TV shows and movies. You can instantly watch over 40,000 movies and TV episodes with titles for everyone. Also, you have access to ad-free music that you can stream to your device of choice. They are constantly updating and rotating new content. You also have access to free 2-day shipping on products with no minimum order size. Another nice feature is you can borrow books from the Kindle owners’ lending library. See Our Full Review of Amazon Video and Music Streaming Service. Hulu Plus is another great streaming service. They have a huge amount of content from TV shows and movies. Hulu is available on just about any device. You can stream unlimited content to a tablet, phone, streaming device, computer or game console, their service starts at $7.99 a month. Netflix has become a household name. With Netflix, you have access to a lot of content. They offer a large selection of movies and TV show for $7.99 a month. It’s a bargain. Their videos can be streamed to just about any device. They also have been creating their own shows like House of Cards and Orange is The New Black. I foresee other online content providers following suit and trying to create original content to compete with Netflix. Sling TV is a $20 per month service that offers over 20 live cable channels, including AMC, ESPN, CNN, HGTV, TBS, Food Network, TNT and many more. Some of those channels offer on-demand video as well, and some include a way to pause, rewind, and watch several days worth of past programming. Vudu offers many options from TV shows to movies. They have a nice selection of content, with many of the latest offerings. Vudu allows you to rent or own the digital content for a fee. It is a good choice to catch up on a season of a TV show or binge watch some movies. Find Thousands of Movies for Only $2 for 2 Nights at Vudu! Crackle is a free service that has a decent amount of content from TV show and movies. They have some popular original content like Jerry Seinfeld’s hit series Comedians in Cars Getting Coffee. Crackle has a nice selection and they keep rotating new content. It’s definitely worth checking out. You Tube has some great content. You can watch movies and some older TV shows. They have been the online streaming content giant for a long time. They do have a nice selection of free streaming movies. They are hard to find, but with a little searching, you can enjoy many hours of endless content. Try searching for a movie and see what shows up. You might be surprised at what you will find. Most of their movies tend to be older or B movies. Here is the direct link to the free movie section. They also have some excellent original content and channels. If you are looking for some great how-to videos, You Tube is the place to find it. If you want premium content you can watch current TV shows and movies for around $1.99. Check Out Our Full List of Free TV shows and Movie Websites. See Our Article on Alternatives to Cable Television for More Streaming Resources. The Roku 3 offers the easiest way to enjoy streaming content on your TV. It comes with over 2,000 channels, allowing you to watch Amazon Prime Instant Video, Netflix, Hulu and thousands of other channels. This device allows for an Ethernet or wireless connection. You can also plug in remote devices like a USB hard drive to stream your personal videos. If you are looking for private audio, it has a nice feature that allows you to plug in your headphones into the remote. There Roku app lets you beam photos, songs, and videos from your phone or tablet to your TV. Great device to cut cable. The Matricom G-Box Q3 will do full 1080p and 4k Ultra HD resolutions. It has a Quad Core S905X CPU paired with the powerful Mali-450MP Penta-Core 3D GPU Graphics Processor. The G-Box Q3 is 30% more power than the G-Box Q2. It is slightly larger than a Roku but does so much more. Watch movies and live streams with vivid and smooth playback. The new launcher on the G-box is great and easy to navigate. The Quad Core S905X CPU has no issues playing back full 1080P and it plays back 4K video without dropping any frames. This box is very quick going in and out of apps and simple to set up when you first take it out of the box. It can play MKV, AVI, MP4s… without any effort. It handles games like Candy Crush and Clash of Clans really well, with no glitches or freezes. You can leave it running all day and it will not overheat. The Matricom team is continually working to improve this device with firmware updates. This box has an updating feature that will keep it current with the latest firmware and plugins. This box comes with an HDMI cable and remote. This unit also allows you to plug in a full keyboard. Kodi works seamlessly with this great overall streaming box. If you are planning to use Amazon Prime with the Matricom G-Box Q3, it works exceptionally well and is fully supported. Amazon’s Fire TV Stick connects to the HDMI port of your TV and requires a wireless internet connection. You can enjoy over 200,000 TV episodes and movies on Netflix, Amazon Instant Video, HBO GO, and Hulu Plus, with games, music, and more. You can stream movies and TV shows in up to 1080p HD. Enjoy rich surround sound with Dolby Digital Plus (up to 7.1). The Fire TV Stick’s user-friendly interface makes it easy to find what you want. Browse popular movies, shows, and recommendations personalized for you right on your home screen, and instantly add new discoveries to your watchlist with a single click. At around $40.00 dollars, it’s a no-brainer. Mohu makes a great selection of antennas in all types of sizes. They have antennas for any distance range. They are a trusted brand and sell quality built over the air antennas. 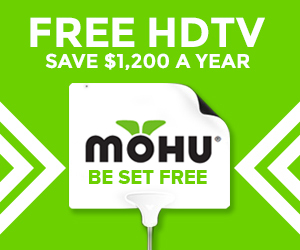 Since introducing the best-selling, #1 rated paper-thin Leaf Antenna in March 2011, Mohu has helped customers save more than $220 million by reducing or eliminating their monthly cable and satellite bills. Find the right antenna for you! Click to enter your zip code and see how you can watch HDTV for free! Antennas Direct is committed to delivering a superior product along with outstanding customer service. With advanced designs, they have always believed superior quality antennas can deliver performance and reliability at a very affordable price. All antenna products come with a lifetime warranty. FREE best way ground shipping on all orders of $49.99 and up! They make a wide range of antennas to suit any distance. High quality built to last. Antennas Direct – Makers of the ClearStream line of antennas specifically designed for digital TV signals. Buy direct & save! Check out our guide on how to choose an over the air antenna. Samsung makes a great line of televisions from all ranges and sizes. I have purchased several Samsung TV’s and have never been unsatisfied. Check out their complete selection here. Bose makes the best sound systems on the planet. The Bose CineMate 15 effect is more like being in a theater, immersed in the action. If you’re playing a video game, the virtual world becomes even more real. While the system fills the room with sound, it takes up very little space. This speaker system allows for a simple and cost-effective way to have great sound for your viewing experience. The iPazzPort mini remote really crams a lot of functions into a package with the size and feel of a medium sized remote control. All the keyboard and mouse functions are on one side of the device and the AV remote buttons are on the flip side. Training the IR commands is very intuitive and much simpler than other types of learning remotes. The iPazzPort can be trained to mimic most any IR remote control function. All of the keys are where they would be on a full-size keyboard in addition to a page up and page down keys on the side of the device. It also has a bright back-light that allows for night viewing. It has a short recharge time and only takes about two hours to fully charge the battery. This is an awesome remote and does exactly what it’s supposed to do. Compare ISP providers using my search page. Magic Jack is a Voice Over IP phone service that can be used anywhere with internet. This device can be plugged into your router to be used with your home phone over an internet connection. They also allow you to take your old phone number with you. I have been using Magic Jack for years and am very happy with the service. They cost is a fraction of what you pay the phone or cable companies. Magic jack includes free mobile calling over WiFi on your smartphone and tablet with the magicApp. Free unlimited calling to the U.S. and Canada. Free unlimited magicJack-to-magicJack calls worldwide. Free Caller ID, Voicemail, Call Forwarding, Call Waiting, Conference Calling and no monthly bills. Need help installing a HD antenna, mounting a TV or setting up a streaming box. Amazon home services offers a solution. Just go to their Home Services section and enter your zip code. You can schedule a qualified technician in your area to help you with your technical needs. Thanks for checking out my recommendation page. I hope it will help you make informed choices. The only digital media players I know of are these: http://p2pworld.pl/?tv=the-best-digital-media-players-for-usb-drives-and-sdsdhc-cards/. They can be hooked up to older tvs with an included AV cable that supports composite out. They are about the size of a deck of cards. Easy to setup and playback many different video file formats.